Plans are underway by the Worcester Locomotive Society to hold a book signing to coincide with the SDR's forthcoming 40th Anniversary gala this Easter. 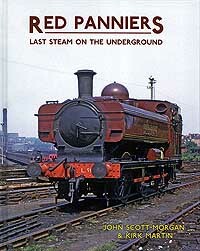 The recently published book "Red Panniers-last Steam on the Underground" by John Scott-Morgan & Kirk Martin, focuses on the history of the handful of ex GW 57xx pannier tanks which were purchased from BR for use on the London Transport underground system for engineering trains due to their low cab height. The book signing is being organised by the WLS, who own ex GWR pannier 5786 (L.92) which will be featuring at the gala in BR Black for the first time in preservation. Following talks with the book authors the society is looking forward to being able to offer Gala attendees on Saturday 11th April a chance to buy a freshly signed copy of this thoroughly interesting and hard to put down book from its sales stand at Buckfastleigh. Although the signing will only take place on the Saturday afternoon, those wishing to purchase a signed copy will still have a chance on subsequent days until stocks run out!